How Do Weight Distribution Hitches Work? Why Do You Need One? Weight distribution hitches have long been the ideal solution for smooth, trouble-free towing. They mean the difference between an easy towing experience and a not-so-enjoyable one, especially in bad weather, rough road conditions, or when weight is a concern. Why do you need a weight distribution hitch? In fact, weight is the number one factor to consider when it comes to towing any travel trailer. For instance, when you consider the gross weight of your trailer and all of your gear in it, weight increases fast. Remember, too, overweight RVs are a bad idea. While standard rear hitches are ideal for light or proper loads, RVers need to use a weight distribution hitch when the tongue weight of the trailer exceeds the weight specifications of the tow vehicle’s receiver hitch. Short of heading to a weigh station, there are tell-tale signs when you need to add a weight distribution hitch. For example, standard rear-mounted hitches only transfer the trailer’s weight to the tow vehicle’s rear axle. In simple terms, a weight distribution hitch corrects all of this. Rather than the rear axle of the tow vehicle taking on all of the weight of the trailer, a weight distribution hitch transfers the weight evenly across the frame of the trailer and the frame of the tow vehicle. This allows RVers to tow their trailer level. It also provides a smooth, stable ride, easier steering, and extends the life of your tires. “The mechanics of any weight distribution hitch includes a hitch head, trunions, bars and latches,” says Rick Kauer, Field Sales Representative of Blue OX, the manufacturer of the popular SwayPro weight distribution hitch. Most of all, weight distribution hitches help minimize dreaded trailer sway. And, according to Kauer, there are two types of weight distribution hitches available that incorporate anti-sway devices. These include sway control hitches and sway prevention hitches. While a sway control hitch brings the trailer back under control after it starts swaying, a sway prevention hitch doesn’t allow the trailer to sway at all. Regardless, either model still offers a high degree of road safety and you’ll avoid a potential trailer sway wreck. Although RVers don’t need a physics degree to install a weight distribution hitch, its best to consult a towing expert. This not only ensures a proper setup but allows for stress-free towing experiences during your adventures on the road. Some hitches come with two different ratings, one standard maximum load rating and a higher rating for when towing with weight distribution gear. This is often because the tow vehicles payload and TW capacity is capable of towing up to a maximum trailer weight without WDH. The WDH basically transfer a certain percentage of a trailers TW to the front and rear wheels of a two vehicle. A percentage that usually differs slightly between the front and rear wheels. Your TW is created by the weight of a trailer so a portion of your trailer weight is part of the TW. Repositioning payload in the tow vehicle and trailer helps to improve the TW for towing which is based on a certain percentage of GTWR. No, the WDH shifts load from the tug’s rear axle to the tug’s front axle and to the trailer’s axle(s). The ratio of load to the front and load to the trailer depends only on the distances between the axles, not the design or adjustment of the hitch. The WDH does not change the tongue weight of the trailer, and in conventional designs greatly increases the force down on the hitch ball. I was trying to explain WDH operations from memory of another person’s explanation. My interpretation from memory was incorrect. After going over the actual explanation from a user in the Airstream forum. That person in the Airstream forum did not understand how WD systems work. You can’t just decide that each of the axles will carry one-third of the load, because the fraction depends on the distances between the axles. Leave out that specific fraction and just say “some” of the load, and the explanation would be correct. “Sway prevention works in all conditions as it relies on a caster, which is a two-angle setting, built into the hitch head,” adds Coppo. A caster? Can someone explain to me what this means? I’m a mechanical engineer and have been designing hitches and parts for 20 years so I’d like to know what this caster mechanism is and how it works to prevent trailer sway. Conventional WD hitches use two spring bars, which pull down on the trailer, and are anchored in the hitch head in a way which allows them to pivot.. While the bar pivot axis is usually vertical, the spring bars of the Bue Ox SwayPro are pivoted around an axis inclined significantly rearward (at the top); they appear to be calling this the caster angle. I assume that Blue Ox’s intention is that with the spring bar pivots inclined back, and the bars skewed outward (due to the trailer tongue angle) when the rig is straight, a deviation from straight ahead (yaw) will decrease the spring deflection on the side the trailer yaws toward, and increase it on the other side. Since the chain on the side toward the sway is angled to pull the trailer rearward, and the chain on the other side is angled to pull it forward, the horizontal component of the chain forces should tend to pull the trailer toward straight. Update: I sent a query to Blue Ox about an unrelated product and received a prompt and helpful reply… so it might be worth just asking them how caster works in the SwayPro. There seems to be a quite a range in prices for WDHs, from a few hundred dollars to more than 2,000 dollars, depending on features, mods, quality, etc. Some manufactures have come up with their own modifications and methods for their WDH. Weight distribution hitches are an attempt to correct a combination of fundamental engineering flaws in the design of trailers combined with the design of tow vehicles that require a hitch point that is an extended distance behind the rear axle of the tow vehicle. 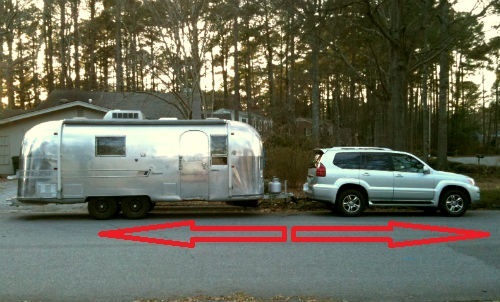 Simply adding six feet to the tongue of the pictured large Airstream trailer would reduce the effects of those flaws, resulting in much more stable and safer towing while eliminating an expensive, cumbersome and dangerous weight distribution hitch. Even an addition of three feet to the tongue would help tremendously. The portion of a trailer’s weight carried by the tow vehicle is not as critical as the leverage the tow vehicle has on the trailer. A longer trailer tongue is a longer lever. I am not an engineer, but this seems to read that you are allowed to overload your vehicle with the use of a WDH. Pulling anything that is heavier than your vehicle is designed to pull just doesn’t seem like a good idea to me, even with a WDH. I can see using it to eliminate sway but how do you know the weight of the trailer you can legally pull with the addition of a WDH unless it is specifically designed for each individual vehicle and receiver? That’s correct: while many vehicles have a higher hitch weight limit in weight-distributing mode (that is when a WDH is used), compared to their limit in weight-carrying mode (that is, without WD), a WD system does NOT exempt the user from the hitch weight limit. Hiw tight should the chain be? super tight, snug or jus enought theres no slack? Ive asked uhaul where I bought system & beliwve it ir not he said hecwasnt certain. Sigh. I usually don’t bother asking people who sell things how to make them work. They sell those things; that doesn’t mean they know anything about them. The correct adjustment is NOT based on how “snug” the chains are. In reading the comments on sway control and the different products out there to control such, I read nothing about proper loading of a bumper pull trailer. Simply put if your trailer is loaded correctly with the proper tongue weight your chances of trailer sway just about becomes a mute point. The 1st thing to learn is what is the proper tongue weight % for your trailer and load your trailer correctly to start with and you will have a pleasant driving experience. For added security and peace of mind add your favored sway control device. 1st and foremost load your trailer correctly towing basics 101. ANY ONE INTERESTED MAY E-MAIL ME AND I WILL TRY TO E-MAIL TO THEM A DESIGN FORMULAR THAT REMOVES GUESS WORK WITH A WDH!! I would like to have that information. There’s no need for a formula. Every WD system comes with an installation manual, and every installation manual which I have seen clearly describes how to adjust the system based on axle loads (usually as indicated by change in ride height). Durning a recent trip we had a wheel fall off. We have a single axle travel trailer. The entire axle had to be replaced. The axle is rated 3500 lbs each brake drum is rated at 3500 lbs. When using a WDH does the WDH put more weight on the trailer axle and brake components? Yes, the WD system transfers load from the tow vehicle’s rear axle, to the tow vehicle’s front axle and the trailer axle(s). The proportion of the split depends only on the distances between the axles (the tow vehicle’s wheelbase and the distance from the tow vehicle’s rear axle to the trailer axle(s). the load being transferred to the tow vehicle’s front axle is 6% of the trailer weight, and the load being transferred to the trailer axle(s) is 4% of the trailer weight. In this example, the axles normally carry 85% of the trailer’s weight so this is only a 5% increase. Also, if the axle is rated at 3500 pounds it almost certainly does not have brakes rated for 3500 pounds each. The drums are integral with the hubs, and the hubs, brakes, and bearings will be rated for 3500 pounds per axle (pair of these components). We had a 1/2 ton Dodge ram when we purchased our 17 ft Mighty Lite. At that time weight distribution bars and a separate sway bar were installed on the hitch. We now have a Ram one ton diesel, will we still need WDB and sway bar for this light of a trailer? a WD hitch is a fraud. they do NOT distribute weight. they work by torsion, which then vectors the force forwards. [fact; no bars, no torsion]. this torsion then causes the hitch point to rise, which achieves the “levelling”. but the force vector is applied to the tug’s frame, which can then crack under certain conditions. the same ‘levelling’ and ‘weight’ effects can be achieved simply adding air bags to the rear suspension to counteract the sag created by the trailer. physics and maths prove this easily. This type of product is not just a fraud, but I agree that the name is poor. They are LOAD-distributing hitch systems: they change the load on each axle, within the obvious physical constraints (total load is unchanged, and effective load centre is not moved). Rob, you’re just making the lack of clarity worse by describing the effect on the tow vehicle without also considering the trailer. The desired action is to shift load off of the tug’s rear axle and onto the tug’s front axle; the corresponding reaction is to add load to the trailer axle. There are some variations in system design, but they can’t change the ratios between the load changes, which are a simple and direct result of the distances between the axles. There is no need for any load-redistribution or suspension equipment to get the trailer level, since the ball height can just be adjusted as required. Spring changes (including air bags) can certainly change the tug’s ride height (and improve suspension performance), but do not change load distribution between the axles. Many bumper pull trailers are engineered like a teeter-totter with the wheels/axle(s) being the fulcrum, In an effort to stabilize this teeter-totter design you in effect put a 10 to 15% heavier child on the front. This teeter-totter design is inherently unstable for a vehicle being pulled down the road at highway speeds. They are designed that way because most cars/pickups that get utilized as tow vehicles while having plenty of engine power, have weak suspension springs for a smoother ride when hauling nothing but passengers, They can’t stand much extra weight. Also most have an extensive amount of “overhang” or distance from the tow vehicle’s THE LONGER THE TRAILER TONGUE IS, THE MORE STABLE THE TRAILER WILL TOW. Take for EXAMPLE a 3,000 lb trailer with a distance of 12 feet from the trailer axle to the hitch point including a 2 1/2 ft tongue, loaded to have the traditional 10% 300 .lbs tongue weight. Now don’t change anything about the trailer weight but bolt a tongue that is 5 1/2 ft. longer to the trailer tongue for a total tongue length of 8 ft. he result will be much less tongue weight than the 10% (300 lbs). That trailer with no changes other than its longer tongue will be MUCH MORE STABLE at highway speeds. with any given tow vehicle. You can play with these figures and change these lengths yourself. Don’t like an eight foot tongue, try a five foot tongue. It will still help tremendously. Any improvement in the ratio of overhang distance on the tow vehicle to trailer tongue length (even a few inches) will increase stability. The people who design and engineer travel trailers appear to have a very poor understanding of this. I have never seen a weight distribution hitch on a U-Haul trailer and they rent thousands of them. You seldom see one fishtailing. If you do it is because it is loaded tail heavy so as to have negative weight on the hitch. If you look at a U-Haul trailer you can see that the tongue is a slightly longer proportion and the wheels are set back slightly further under the body of the trailer. than a “normal” trailer. I am not saying that weight distribution hitches don’t help, I am saying that WEIGHT DISTRIBUTION HITCHES ARE AN EXPENSIVE AND DANGEROUS SOLUTION TO A POORLY ENGINEERED TRAILER. Bruce, what do you mean by “many bumper pull trailers are engineered like a teeter-totter with the wheels/axle(s) being the fulcrum”? Any trailer with a single axle group (a “pony’ trailer, like any recreational travel trailer) is balanced this way, not just “many” of them. While stability is inherently limited, it’s not inherently a problem for highway speed operation. I agree that a long distance from the trailer axle to the ball (relative to trailer length) and short distance from tug’s rear axle to ball (relative to tug wheelbase) are beneficial to stability. They’re not the only factors. U-Haul trailers have conventional proportions. In any competently designed trailer – including travel trailers – the axle is always behind the centre of mass… it needs to be. Of course U-Haul trailers don’t use WD hitch systems, because that would not be practical with random tow vehicles in rental service. Conventional commercial trailers don’t use them, either – WD is a recreational thing; I agree that is due to marginally adequate tow vehicles. Bruce – does this mean if an extension is used on the hitch to push the BALL out 6 inches or so (Effectively making the tongue longer ) the hitch/tongue weight will reduce? No. 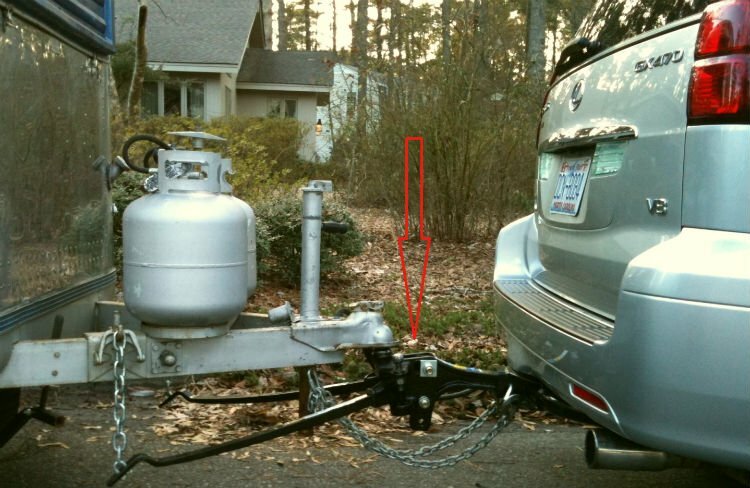 Extending the hitch does not change the tongue weight of the trailer, It does make the load transfer effect on the tow vehicle (unloading the front and loading up the rear) worse. To improve stability by length changes, you need to extend the tongue of the trailer (coupler further ahead of axle), or REDUCE the hitch length (distance from tow vehicle’s rear axle to ball). No, that would not be making the trailer tongue longer, it would be making the over hang of the tow vehicle longer.